The 10th Commandment of Enterprise is CELEBRATION! "Depravity is a sin; as is Overindulgence"
Reward comes in many forms other than the tangible materialist ones; money, vacations, plaques and gold watches. 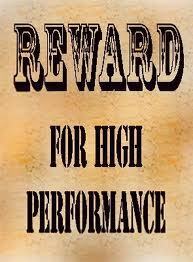 Intangible things like praise, honor, recognition and favor come with different price tags. Whether tangible or not, they are rewards that are intended to be claimed and released to those who have deserved them.